City Hall’s reign had come to an end. 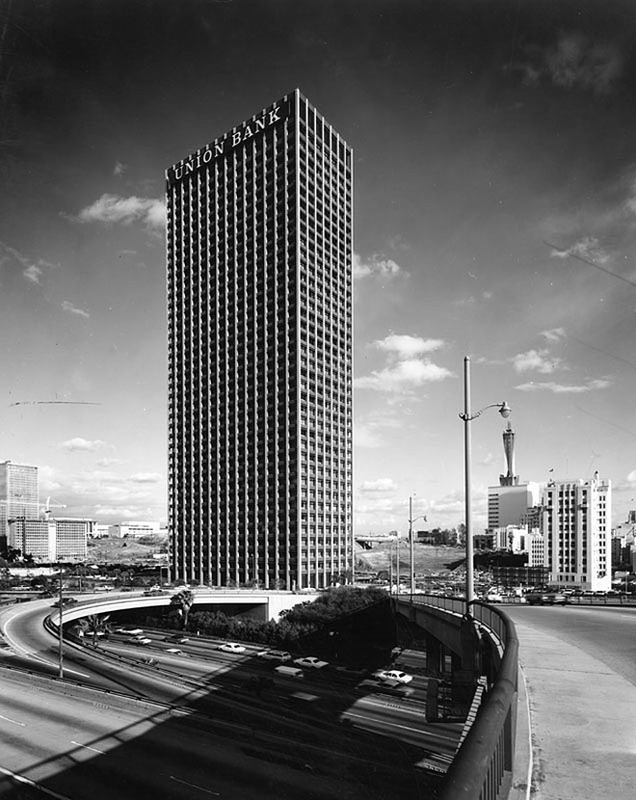 When Union Bank Square opened its doors on December 22, 1966, the 42-story office tower claimed its crown as the tallest building in Los Angeles. It was certainly not downtown L.A.’s first modern skyscraper; the 267-foot California Bank Building had opened in 1960 and the 452-foot Occidental Center Tower in 1965. But the new, 516-foot Union Bank Square at Fifth and Figueroa was the first to finally dethrone 454-foot City Hall, long the beneficiary of a citywide 13-story height limit. Height wasn’t all that distinguished the building. It was also the first major development in the Bunker Hill redevelopment zone and it marked the first wave in a westward move of the city’s financial district from its traditional home along Spring Street. Also notable was a three-acre private park that topped a parking garage at the tower’s base. Designed by Harrison and Abramowitz of New York with A.C. Martin and Associates consulting as local architects, Union Bank Plaza flaunted its steel structure with prominent, white-and-grey metal piers set against dark, recessed windows. (A 1994-95 renovation since changed its look.) It also advertised its main tenant, Union Bank of California, in large block letters near its top. That practice, new then to downtown L.A. and frowned upon by many, has become commonplace now. Next articleTaco Madness, Wine Festival at Shade Hotel, and More!